Congratulations on your forthcoming wedding! Whether you plan to have a civil or church ceremony, say that special ‘I do’ in our exquisite, award-winning wedding venue in the Reading | Wokingham area. Holiday Inn Reading offers exceptional wedding packages to suite everyone, all within travelling distance of London, Reading, Wokingham and Bracknell. Our wedding facilities support all choices from traditional English, traditional Indian, Civil, Contemporary and many more. Get in touch to see how your choice in Wedding can be executed by our team of trained and happy wedding facilitators. Your wedding ceremony is a moment that will stay with you forever, marking the beginning of your life together as a married couple. You want the confidence that every little detail from the flower arrangement to the table name tags is being looked after entirely. Here at the Holiday Inn Reading | Wokingham you can rest assured that we have everything under control. Work with us to build you dream day, have it your way and your way only. The 4 Silver Star 2 AA Rosette Holiday Inn Reading M4 Jct10 in Wokingham, Berkshire is the perfect spot to host your wedding and reception. We are licensed for Civil Wedding Ceremonies in the Buckingham Suite (240 guests) and the Frogmore Suite (110 guests) - allowing for you to house all your celebrations in a single location. Our dedicated Team will be looking forward to welcoming you soon! Accompanying any wedding celebrations at the hotel is a dedicated wedding facilitator to help you plan your big day and make sure that you have everything you need. Our flexibility, experience, attention to detail and superb facilities will guarantee you a successful day. You can relax on the day and be assured that our friendly staff will be ready waiting to greet you on arrival and relaxed in the knowledge that all items such as cake stand and personalized menu have been organised to your satisfaction. In addition to the full wedding services we provide, we’ll also offer special accommodation rates for all your guests who wish to stay overnight. Alongside this, we can also assist you with future celebrations ranging from anniversaries and birthdays, to christenings and graduation celebrations. The Bride and Groom will also enjoy a number of complimentary benefits. You’ll be invited to stay in one of our lovely Suites on the night and enjoy a complimentary Full Buffet Breakfast or a romantic Breakfast in Bed the next morning, the choice is yours. Good quality food is essential for the success of the whole occasion. We’re in a prime position to help you select from a variety of meal options, drink packages and our extensive wine list to ensure you get the perfect package for your big day. Alternatively, if you have already planned this, we can accommodate this on your behalf and ensure everything runs smoothly. 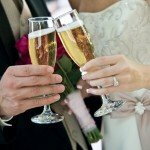 “We had a great evening at the holiday inn and the couple had a great night. Overall the evening went well, and the service and staff were amazing. Even during the day when we were setting up everyone was really helpful and supported all our requests. Our stay at the hotel was really nice, the rooms were great. Thanks again for all your support and making the day wonderful for my brother and his wife”. “We would like to say a big "THANK YOU" to you all at the Holiday Inn for making our special day run so smoothly. It was a perfect day and one of the happiest days of our lives." Read more of our wedding reviews. For more information on our Wedding Venue in Wokingham, Berkshire near Reading or to speak to our Dedicated Conference & Events Team, please call 0118 944 4230 or email events1@hireadinghotel.com and they will be happy to help.